Avant-garde original music, eight-part vocals, a soaring brass section, and a poetic design, make Fractal Folk performances absolutely unforgettable. Composer and arranger Krys Baker, is a multi-instrumentalist playing over a dozen different instruments. 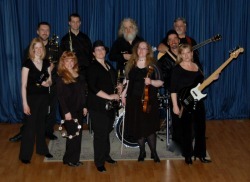 The versatile band is comprised of a mix of local and professional musicians gifting the audience with the sounds of mandolin, drums, bowed psaltry, electric bass, acoustic guitars, piano, trumpets, trombones, flutes, clarinet, saxophone, hand percussion, and harmonica... just to name a few. Eclectic is a Fractal Folk mantra. At home at festivals, wine tastings, coffee shops, pubs, parties, and picnics, Fractal Folk can provide groups of any size, providing distinctive original music for practically all venues. So take a seat, lend an ear, and don't forget to ask, “Why So Many Muffins?